It may not be the first thing you notice when you look at a house, but the driveway does impact the overall look. It’s easy to overlook a smooth, well-maintained concrete driveway, but one with unsightly cracks or holes detracts from the quality and appeal of the house. Concrete Network put together a handy guide for caring for your concrete driveway in order to keep it, and your home, looking beautiful. Here are a few care tips. In Oklahoma, your driveway is subject to hard rains and hail, snow and ice and blistering sun at different points of the year. All of this extreme weather take its toll over time. Especially if dirt and debris are left without attention. Typically, it’s a good idea to regularly hose off and clean your driveway to prevent cracks from developing. Resealing your driveway also helps to keep it clean and looking like new. Most contractors advise you reseal every 2 years, but your driveway may need it more often if it experiences more extreme weather or heavy traffic. While a grease, gas or oil stain likely won’t harm your driveway’s structure, it does create unsightly blemishes that detract from your home’s appeal. Having a freshly sealed driveway helps to keep spills from staining the concrete, but it’s always a good idea to thoroughly clean them as soon as they happen. For tough stains that won’t come up, consider a pressure washer combined with cleaning chemicals, but be cautious that some chemicals can be harmful to concrete. One such chemical that actually attacks concrete is deicer. Oklahoma winters typically ice over driveways at least a few times each year and deicer is extremely helpful to make your driveway more passable. Unfortunately, it can also cause surface damage to the concrete. Rock salt is better for concrete, but is harmful to vehicles and your lawn. An alternative would be to put down sand for better traction, but be sure to wash your driveway when the ice clears to remove excess sand and dirt. Concrete is a durable material, which is why it’s so often used for driveways. It’s not intended for any load, however. Heavier vehicles, like fully loaded moving trucks and construction equipment can cause cracks and other damage to the concrete. Even long-term storage of boats or RVs can end in damage to your driveway. Consider alternatives like street parking or off premises storage for large vehicles to prevent the need to replace your driveway. At Perry Hood Properties, we build houses in the Tulsa, Bixby and Broken Arrow areas with high quality materials. We use these materials so our homes will stay beautiful for as long as you own the home. 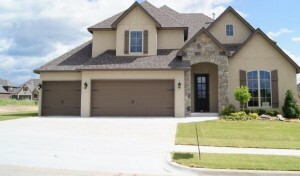 To browse through our currently available homes, please visit our Catalog page or call us at 918-250-2663. You may not need your air conditioner now, but that makes it a great time to for maintenance and some routine cleaning. You certainly don’t want to wait until the first hot day of the year to find out that your air conditioner isn’t working. At Small Notebook, there’s a helpful list of ways you can get your air conditioner ready for warmer weather and keep it running throughout the summer. Here are the vital tips every homeowner needs to know. Most of us know that air filters need to be changed regularly. Doing so regularly improves the quality of your air and prolongs the life of your air conditioner. Think of it like changing the oil in your car. Typically, changing it every 3 months during use of your A/C is recommended, but you’ll want to change it more often if you have severe allergies. There are plenty of options in filters, but don’t skimp and buy the cheapest available. Pleated synthetic filters don’t cost much more, but do a better job for longer. How efficient your air conditioning unit is running not only dictates how cool your home stays, but also how high your electricity bill is likely to be. Before the peak of summer, measure efficiency by comparing the temperature of air coming out of the vents with the air going into the return vent. There should be about a 15-degree difference. If it’s more, it could signal it’s time to change your filters. If the difference is less, you’ll need some maintenance on your A/C like more Freon. The ducts in your home are responsible for carrying air to the vents in each room. If they’re not properly maintained, an efficient unit is unable to distribute cool air properly. Go to your attic to see if there are any leaks that allow cool air to escape before it reaches the vents. If so, you can either replace the duct, or try to patch it with duct tape. It’s also a good idea to invest in insulation to wrap around the ducts so that the heat from the attic doesn’t affect the cool air. Finally, keep ducts free of debris and dust by protecting them during any home renovation project. Cover the return air vents in your home with air filters to keep all that dust out. The unit outside of your home, also known as the condenser, needs to be clean in order to have sufficient airflow. When it’s dirty, it either stops working, or must work harder, which uses more energy. One cleaning per year is usually plenty, but you should clean the condenser when it is visibly dirty. To do so, turn off the power, then rinse with a hose. Don’t use much pressure because some parts of the unit can bend easily. Your goal is to remove dirt and debris from between the small openings, or fins, on the condenser. 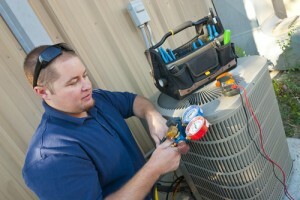 Keeping your air conditioner running is vital during the sweltering Oklahoma summers. These tips will help you keep energy costs low and regular maintenance will keep you from paying big repair bills. At Perry Hood Properties, we want our homeowners to keep their homes looking beautiful for years after they buy them. We use high quality products to help homes look like new. Browse through our available homes and call us today! Granite countertops look great and can be found in most of our available homes, but keeping them looking like new takes a little expertise. At WikiHow, there’s a helpful list of cleaning and care tips that will keep your granite countertops looking the way they did when you moved in. Here’s everything you need to know. There are many cleaning products that are actually harmful to your granite surfaces. Powdered and acidic cleaners will actually damage your countertops over time. Instead, simply try warm water with a dish washing detergent. Clean with a soft cloth, then rinse with water and dry. Be sure to clean stains as they happen. It’s also important to remember that prolonged exposure to hot pans is harmful and using your countertop as a cutting surface will result in scratches and nicks. If your counters have been neglected and are in need of some renovation, you’ll need more than soap and water. There are a number of products specifically for cleaning stone available. Consider using one of these along with a degreaser for a deep clean that won’t damage the stone. Continue using a soft cloth as using stiff brushes or similar products could scratch your counters. Typically, wiping up a spill is all that’s necessary to remove a stain on granite countertops. However, you’ll occasionally find a stubborn stain that doesn’t come out so easily, especially if it’s been left for a long time or subjected to heat. In these cases, use a poultice. This is an absorptive clay powder that will pull deep set stains out of stone. It may also remove the polish, but you can use a marble polish to restore it once the stain is gone. 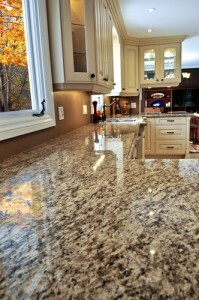 Not all countertops require a seal and many manufacturers treat their granite before it leaves the factory. 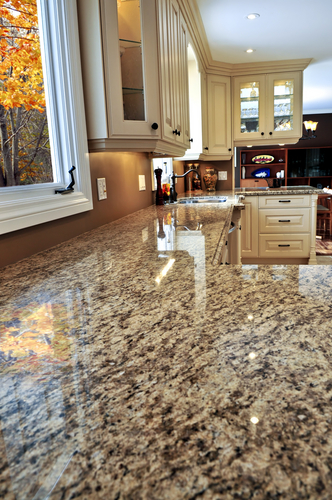 If your countertops are more than 10 years old, however, they may need to be resealed. It’s a good idea to check with the manufacturer before sealing. If your counters need it, start by thoroughly cleaning them. Once the granite has dried for several hours, spread sealer with a rag or foam brush, let dry for 10-minutes then apply a second coat. Be sure to blot any spots or drips. After it sets for 12-hours, your counters should be ready to use again. These are the basic maintenance tips any homeowner needs to know in order to keep their granite counters looking beautiful. For homes featuring granite countertops and many other amenities, call Perry Hood Properties or browse through our available homes. Spring is coming, which brings with it a list of chores to do around the house. Winter takes a toll, especially on the outside of your home, and the start of spring is a great time to repair the damage. At the HGTV blog, Dwight Barnett put together a “maintenance list” for homeowners to take care of this spring. Here are a few tasks you’ll want to do to keep your home looking beautiful. You probably haven’t cleaned the gutters since the fall so you’ll want to ensure they’re free of debris before the spring rains. 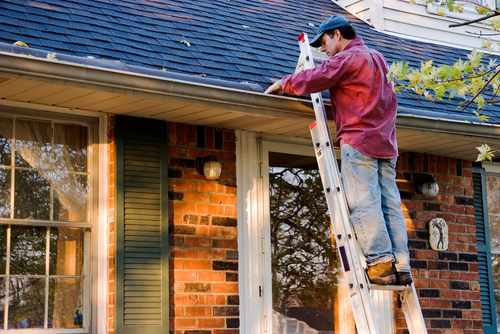 While you’re up there, check for any leaks or loose gutters. And be sure that all downspouts point away from your foundation. The winter months tend to result in low areas and holes throughout your yard and garden. Animals, rains and snow tend to remove soil and leave vulnerable areas for flooding and standing water, which attracts insects in the summer. The early spring is an ideal time to buy a few bags of soil and fill in any areas that need it. You can survey from the ground for any apparent damage or missing shingles, but it’s also a good idea to climb onto the roof for a closer look. That’s the only way you’ll be able to spot shingles that are damaged but still in place. You’ll also be able to examine the exterior of your chimney. Your heater and your A/C require annual service calls to keep them operating efficiently. You could wait until the fall to have your heater serviced, but it’s usually easier to remember to have both done at once. Not only will a serviceman be able to keep both units running for the duration of the season, but they’ll also save you on energy costs by keeping the units clean. The spring is also a good time to change interior filters. These tasks keep your home looking nice and save you on potentially costly repairs down the road. At Perry Hood Properties, we build beautiful homes throughout the Tulsa, Bixby and Broken Arrow areas. To browse through our available homes, click here. While there’s still plenty of cold temperatures in the forecast, now’s a great time to start planning for the spring care of your home’s lawn. The lawn plays a big role in the overall look of your home so you want to make sure you lay the groundwork early in the year in order to enjoy a lush, full lawn throughout the summer. 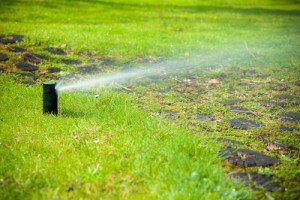 Yahoo Homes put together a valuable list of tips for what your lawn needs early in the spring. Your first step should be is to test the acidity levels and nutrient levels of your soil. This will help you decide what the soil needs added to it in order to grow a healthy lawn. For example, if your soil is too acidic you can add lime to it, but if it’s too alkaline, you’ll need to use sulfur to lower the pH. Since Oklahoma summer’s are hot and dry, grass species start slowly growing in the spring and will continue throughout the summer if properly cared for. In cooler regions, grasses grow more rapidly throughout the spring and won’t grow much over the summer. The key to fertilization is to apply fertilizer when grasses hit their peak growing times. For Oklahoma lawns, this may be when the weather truly starts to get warm and then again in the middle of summer. It’s not just how much you water your lawn that determines its health, but also the way you water. Watering too much can actually make your lawn more susceptible to drought. Typically during the summer, lawns need about an inch of water once per week. Your watering should be done before temperatures hit 80-degrees, which means summer watering needs to be done in the early morning. Watering slowly is also key. This prevents runoff and grass grow deep roots. Now is the time to try to eliminate weeds so they don’t infest your lawn and limit the growth of your grass. Unless you’ve already seeded, look for a pre-emergent herbicide that inhibit the germination and growth of weeds. If you control weeds now, you’re lawn can grow so fully that it won’t allow for the growth of any throughout the year. These four tips are things you should start thinking about now, before spring has officially started. Also, don’t plan to roll out the lawnmower too early. Let your lawn grow for a few weeks until it reaches a height of about 4-inches before clipping it the first time. At Perry Hood Properties, we build beautiful homes in the Tulsa, Bixby and Broken Arrow area and love giving our homeowners tips for how to keep their homes looking gorgeous for years to come. If you’re hunting for a new home, browse through our available homes and give us a call! Even though we’re into February, Oklahoma’s unpredictable climate could still produce plenty of freezing nights in the coming weeks. That means the threat of frozen pipes and the subsequent damage to your home is still a real threat before the official on-set of spring. 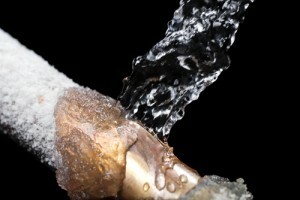 Thankfully, there are some helpful ways to prevent pipes from freezing in the first place. At Popular Mechanics, Roy Berendsohn lists a few of these tips. Here are our favorites. If the weather is bad enough, there’s a chance pipes in any home could freeze. To minimize damage and the associated costs, preparation is key. Know where your water shutoff is located in case of disaster. It’s also helpful to have a temporary patch kit handy. You can find them at most hardware stores and home centers. While they’re not a permanent solution, they can save you from thousands of dollars in water damage and even give you working pipes while you wait on a plumber. While cold temperatures probably have you worrying about your heating bill, it will be much more costly to replace a pipe that has burst due to freezing. By keeping your home warmer, the pipes in the walls and running through your crawl space will be warmer. That may just be enough to keep them above freezing. Pipes that run through an exterior wall are especially vulnerable to freezing. Opening any cabinets along that wall helps heat to keep those pipes slightly warmer. Some even suggest using an electric heater at spots that are the most concerning. Remember, the goal is to simply keep pipes from freezing. They don’t have to be toasty and warm. This is perhaps the easiest measure to prevent pipes from freezing, but also the easiest to forget. When a hose is connected to an outdoor spigot, water rests in the connected pipe and can freeze and burst behind the wall. Repairs can be costly, so before winter begins, be sure to remove and drain all hoses and store them for the season. Since Oklahoma’s weather fluctuates, it’s a good practice to always remove hoses when you’re finished using them. That way, your watering on a warm day in January won’t cost you when the cold front moves in the next week. Frozen pipes create the need for costly repairs and can be the cause of mold growth. It’s worth it to take the time to take every precaution possible to prevent this damage. At Perry Hood Properties, we want your home to stay as beautiful as the day you bought it. But, when you’re ready for a new home, contact us to build terrific floor plans in attractive neighborhoods.